One of the important task of Linux system administrator is to update packages on the servers. There can be some scenarios where Linux admin apply updates on servers but after applying updates application hosted on the server might not work properly due to incompatibility of new updates, In that case we don’t have any option but to rollback updates. 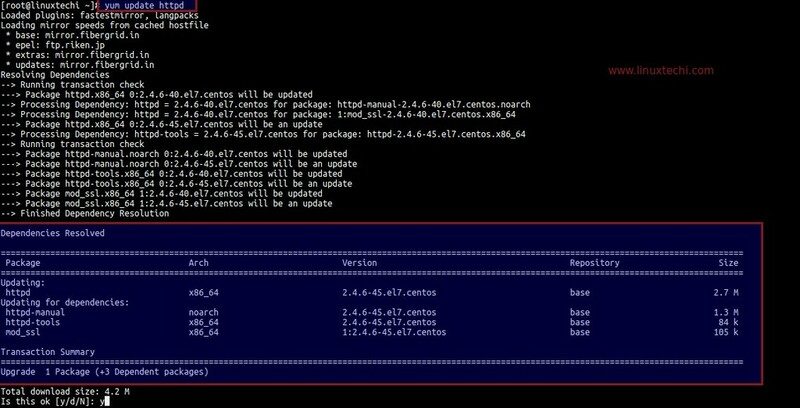 As we know that on Linux servers (RHEL & CentOS) updates are applied with yum command and updates can be rollback with “yum history command“. Let’s assume i have a Apache Web Server running on CentOS 6.x/7.x or RHEL 6.x/7.x. I got the requirement from development to update the existing “httpd” package to the latest one. In above steps we have updated the httpd package but due to compatibility issue we have to rollback httpd to previous version, this can be achieved using yum history command. As per the above output we will get details like when was the update action performed along the transaction id. That’s all for this tutorial.Please share your feedback and comments. This is helpful. Thank you. I had a similar situation, but I wasn’t able to track down when the initial change happened, so I don’t think these steps would help. Let’s say instead of “undoing” an update that we want to downgrade to a previous package. I think my distro version had the latest version of a package, Java, and I wanted to downgrade to an earlier version. Can you explain how to do this? You can use downgrade option in yum command but for that you have to make sure earlier Java version rpm package should be available in your yum repository. 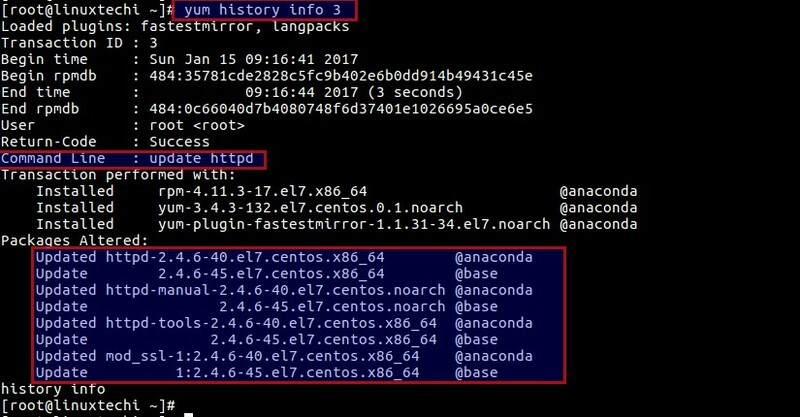 Yum command also stores all its transaction in sqlite database, using “yum history list all” you can check all yum updates history along with time.